*Available in Download, CD-ROM, Text Reader, Hardcopy and Subscriptions. NOTE: The Automated Text Reader provides access to all the information contained in the individual sections of the FMD hard copy product. Within each individual section of FMD, the tool provides basic search and browsing capabilities that allow for locating the information of interest. This Databook contains field failure mode and mechanism distribution data on a variety of electrical, mechanical, and electromechanical parts and assemblies. This data can be used to assist in the performance of reliability analyses and assessments such as Failure Modes, Effects and Criticality Analysis (FMECA) and Fault Tree Analysis (FTA). FMD-2016 represents over 990,000 new records, a 10-times increase over the 98,000 records presented in its predecessor, FMD-2013. The CD-ROM version of FMD-2016 incorporates a user interface with search capabilities that assist in rapid data retrieval. 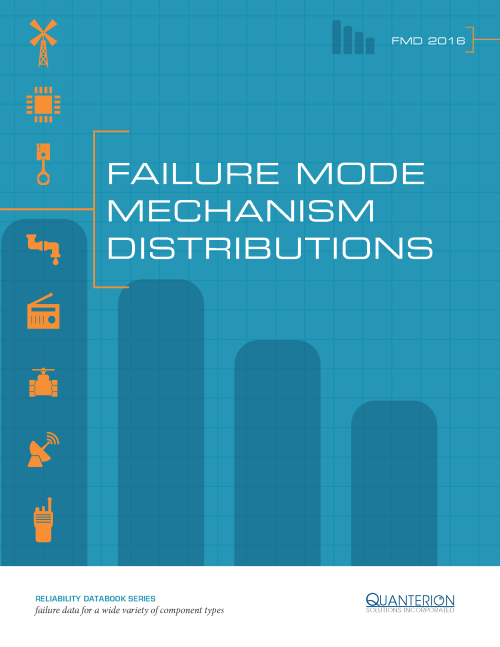 The “Failure Mode/Mechanism Distributions – 2016” (FMD-2016) publication is the fourth in a series that covers Failure Mode and Mechanism Distributions on electronic, electromechanical and mechanical parts and assemblies. It supersedes “Failure Mode/Mechanism Distributions – 2013” and provides a cumulative compendium of failure mode/mechanism data. The intent of this publication is to present failure distributions on parts and assemblies to be used in support of reliability analyses such as FMEAs and FMECAs. Data contained in this book can be used to apportion an item’s failure rate into modal elements by multiplying the failure rate by the percentage attributable to specific failure modes. These distributions provide a baseline set of probabilities to be used in the reliability engineering industry. This document complements the Quanterion publication “Expanded Applications of FMECA“, which provides guidance on performing FMECAs. Part Index: Comprehensive cross-reference to the data contained in Section 2. Each part category has been indexed on all pertinent words contained in the part description.